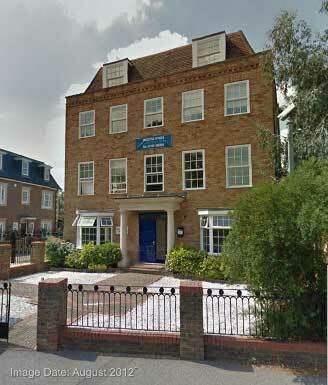 Nicholson House, 41 Thames Street, Weybridge, Surrey, KT13 8JG is very close to the town centre of Weybridge. It is a few minutes away from Waitrose and 2 minutes from Monument Hill. Monument Green leads into Thames Street which is a quiet residential road. There is plenty of free street parking both on Thames Street and the surrounding roads. Nicholson House is a distinctive Georgian building with large blue doors. On arrival please come straight into Reception. Please let the Receptionist know that you have an appointment with me and take a seat. I will come to Reception to greet you and show you to the Consulting Room. Weybridge Station is 1.1 miles away from Nicholson House, 41 Thames Street, Weybridge, Surrey, KT13 8JG. This is about a 22-minute walk. It is a pleasant walk through the centre of Weybridge Town. On the left hand side of the road look out for Nero Coffee, Waitrose and The Ship Hotel. When you get to the Ship Hotel the road curves to the right. Follow the curve and you will see a road called Monument Green. Turn left here – this becomes Thames Street. Nicholson House is a short distance along on the left hand side of the road. There are a number of buses and bus stops which are close to Thames Street.